Smile is a curve that sets everything straight.Its has been proven by research that 30% of the new people you meet judge you and your personality by the kind of smile that you have. Gaps in front teeth is very common and affects a large part of our population. What are the problems that people with gaps in their front teeth face? Firstly gaps or diastema pull down your personality, some patients feel under confident while smiling because of these gaps. Secondly there are functional problems like lisping (release of air while speaking as tongue can not form a proper seal behind the teeth) leakage of fluid or watery food from the gap. Thirdly it becomes difficult to maintain the hygiene around the gaps. These gaps occur because of thumb sucking in child hood or can also occur at a later age in life when gums problem occur which is called as pyorrhoea. What are the treatment options that can be used for treatment of gaps in front teeth in Jaipur? facekraft dental implant clinic is considered to be one of the best centres for smile designing and treatment of gaps in front teeth in Jaipur. Porcelain veneers are better and last longer and are maintenance free. 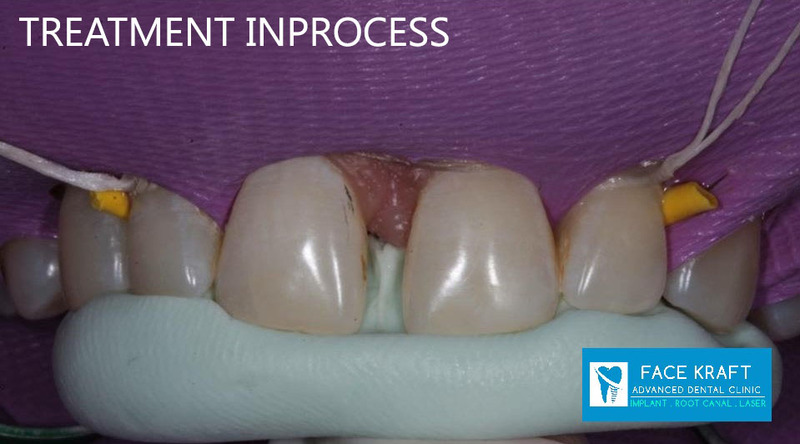 Composite veneers on the other hand require a revision or redo after 3-5 years. However if the gap in teeth is large or big we at facekraft dental clinic might suggest you to go for braces ( orthodontic correction ) to achieve a better cosmetic result. Hence the treatment options suggested by us for gap closure in front teeth in Jaipur will depend on the clinical condition and the amount of space that you have in your front teeth.